Mayor Tom Tait led the parade, a decades-long tradition, through downtown in an aqua blue convertible. Mickey Mouse and Disney "ambassador" Alexa Garcia followed next. Some might argue that Disney is the city's real grand marshal — on and off the parade route. In this election year, the entertainment behemoth is spending heavily on campaigns in hopes of re-establishing the friendly city leadership that in the past gave it benefits like development incentives and other economic assistance. "This is a pivotal election for Anaheim," said Ashley Snee Giovannettone, spokeswoman for the Disney-backed political action committee, Support Our Anaheim Resort. "This city has become hostile to jobs." Anaheim's economy and identity have long been tied to Disney, even though Disneyland and the surrounding Anaheim Resort district occupy just 5 percent of the city's territory. 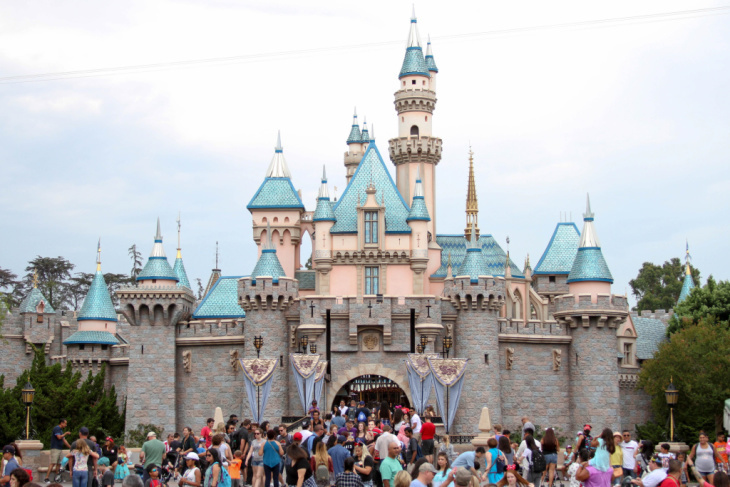 Disneyland employs 30,000 people and the city depends heavily on visitors to the Southern California theme park. The resort district generates more than 50 percent of the city's general fund revenue — a projected $195 million this year — though critics point out that the city also spends $105 million to support and promote the resort district. But some residents and city leaders have come to question Anaheim's relationship with the company. "I love Disneyland, but I can't afford to take my kids to Disneyland," said Anaheim resident Maritza Bermudez while waiting for the parade to start. Bermudez is supporting the re-election campaign of City Councilman Jose Moreno, a Disney critic first elected in 2016. He forms part of a voting bloc that has cancelled building projects and killed subsidies aimed at spurring high-end development in the resort district. Bermudez questioned why, with all the money Disney brings to the city, her largely Latino neighborhood near downtown Anaheim looks no better than similar neighborhoods in next-door Garden Grove or Santa Ana. "We don't see the money trickling into our system, into our schools," she said. Two years ago, in the city's first election in which residents chose representatives by geographic district, voters elected two new council members, Moreno and Denise Barnes. They promised to end major subsidies for Disney and focus more resources on neighborhood improvement. Along with Mayor Tait and Councilman James Vanderbilt, who was elected in 2014, they formed a majority that, for the first time, threatened to end decades of Disney-friendly leadership on the council. They promptly cancelled a generous tax rebate aimed at incentivizing developers of luxury hotels. They also killed a streetcar project thought to benefit primarily Disneyland and the resort district. All the while, City Council meetings stretched into the wee hours of the morning, often due to bickering between what came to be known as the pro- and anti-Disney factions on the council. Business deals that previously breezed through council approval were flagged for closer examination. But that could change after Nov. 6. Mayor Tait is termed out. Moreno and Vanderbilt are up for re-election. And Disney and allied business interests are spending millions in an effort to regain control of the City Council. Disney has spent more than $1.5 million in this election cycle to influence this year's results. Most of the money has been spent on city council campaigns, according to the Los Angeles Times and Voice of OC. The Anaheim Chamber of Commerce has also spent heavily — at least $260,000 on candidate campaigns and more than $530,000 to oppose a minimum wage measure, according to the latest campaign finance disclosures posted on the city's website. The minimum wage measure, Measure L, would guarantee $18 per hour by 2022 for resort district workers whose employers receive city tax breaks. The measure, backed by UNITE HERE Local 11 representing hotel and restaurant workers, is aimed squarely at Disney and owners of several, planned luxury hotels that were grandfathered into the now-defunct tax rebate. The hotel workers union has spent heavily in support of the minimum wage measure. Other unions, including those representing construction trades, have lined up on the opposite side of the measure debate. But after a series of last-minute developments, it's now unclear whether the measure will apply to Disney and whether some of those planned hotels will get built at all. Disney pulled the plug on a planned luxury hotel after it sought to change the hotel location and the city informed the company that it no longer qualified for a tax rebate. Anaheim's city attorney opined in October that the minimum wage measure would not apply to Disney because the company would no longer get the hotel tax rebate and had withdrawn from another tax incentive deal. The matter will likely end up in court, if the measure passes. Councilman Moreno won the 2016 election in Anaheim's District 3 over incumbent Jordan Brandman by just 72 votes. Moreno had previously sued the city to force it to adopt by-district elections, arguing that at-large voting for council positions illegally dilutes Latinos' voting power. Latinos make up more than half of the city's population. This year, Brandman, backed by Disney, is running in District 2. Moreno is running for re-election against Mitch Caldwell, who is backed by Disney and the Anaheim Chamber of Commerce, and a third candidate, Robert Nelson. Moreno is unapologetic about his stance on Disney, but says he supports the company's success. "I haven't seen any candidates wishing harm on Disney. I see candidates standing up to Disney," Moreno said. "And I just hope that upon, hopefully, the people putting us back in office, that we can turn the corner with our corporate interests and become better partners together." Caldwell, a former planning commissioner and neighborhood preservation activist, said Moreno's two years in office have shown he's less focused on neighborhoods than he is on making Disney a villian. But Caldwell is also cautious about his messaging in a district that has proven skeptical of the resort's interest in its well-being. "I'm not here to defend Disney," Caldwell said. "Anything that gets us more money out of the resort is good for me." Still, he said: "I'm not about to choke that resort out. It's the difference between Anaheim being solvent and not solvent." Disney and the resort district are also playing a prominent role in the District 6 council race and the mayoral contest. For mayor, the company and the chamber are backing Harry Sidhu, a businessman and former council member. During his previous tenure on the council, from 2004 to 2012, Sidhu voted in favor of tax rebates for luxury hotels and backed a Disney-supported policy that makes it difficult to build housing in the resort district. Asked about its spending in the election, a Disney spokesman said in a statement: "Anaheim is our home and we care deeply about the community and its leadership. We support candidates who are focused on addressing the vital issues facing our city and ensuring Anaheim's economic vitality, which benefits all residents." Chamber President Todd Ament said decisions made by the current City Council, including dropping the tax rebate for luxury hotels, have jeopardized Anaheim's ability to attract economic development. "Investors like a stable market and the uncertainty of this council has been very dangerous," Ament said. He defended the city's history of generous incentives for Disney and related tourism development, and said such incentives are necessary to bring in the revenue that pays for city services. "It's economic development for community development, he said. "It's unfortunate that some City Council members get on a soap box and call these bad deals for the city." Ament noted that other Southern California cities, including neighboring Garden Grove, offer even bigger incentives for tourism development. Mike Thom, a University of Southern California associate professor who specializes in public finance and tax incentives, said taxpayers often lose out when cities compete to offer ever-better incentives. The threat of, say, a luxury hotel chain bringing construction jobs and tax revenue to a city next door rather than to Anaheim can pressure local leaders to up the ante, potentially beyond what makes economic sense. "It's a real juggling act," Thom said, "and a lot of this gets very contentious because the sums get quite large." He also noted the immense pressure that local leaders can feel when a city's tax and job base is largely dependent on one company or one industry. "It's probably not good for governance," he said.